We have a late start from the hotel – sleep is not forthcoming, despite my best efforts and not taking naps on day 1. So we don’t get out the door until close to 10am. This is not so bad, as I have given one whole day to visiting the most famous of museums, the Louvre. The scope of the Louvre cannot be understated. It’s easy to get turned around in its many halls. I’ve been there several times, and I still have to check my map often. There are three wings, each with three floors, and one with a fourth. There are special auditorium halls, a mall, two cafes, and the exterior plazas and courtyards. The maps are crucial, helpful, and come in a dozen languages. Note: The Louvre is closed on Tuesdays, as are more national museums in France. Note 2: The Louvre entrance is conveniently located at the ligne 1 stop Palais Royale/Musee du Louvre. If you get off at the Louvre/Rivoli stop, you’ll be outside the Louvre and have to walk in. 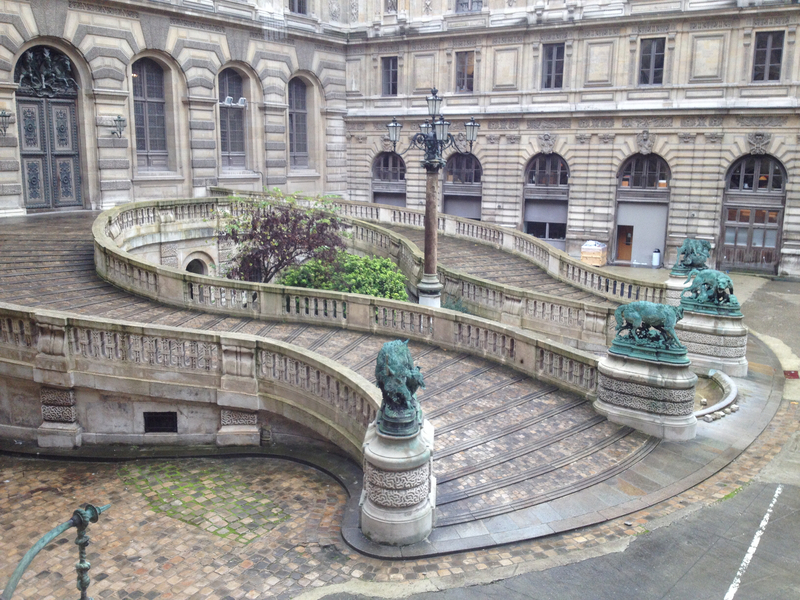 The Musee du Louvre stop links to the carousel (the underground shopping mall and entrance to the museum). You’ll miss the glass pyramid, but you can go outside when you’re done. If you really want to see the glass Pyramid and the beautiful exterior of the building first, then take one of the other three sorties at Palais Royal or ride to Louvre/Rivoli. There are many very famous pieces in the Louvre – the Winged Victory of Samothrace, the large paintings of Delacroix, the Venus de Milo, etc. And, of course, the Mona Lisa (La Jaconde as she is called in France). To see these highlights will take some walking, but it is entirely doable to see them all in a single visit. Use the map (and crowds) to guide you. Nike of Samothraki has her own staircase, at the juncture of the Denon and Sully halls. For the art historian, it helps to know what you want to see. You’ll go numb in the brain just walking the Louvre, covering thousands of years of art from all over the globe. There are Italian masters and Egyptian carvings. You can go from Ancient Greece to 19th century Netherlands, and that’s just what’s on the walls! So narrow it down – do you want to see French painters? Ancient Greek marbles? Look at the map and find a genre. You can go wandering around later, but don’t start out lost. “The Arrival of the Harvesters” by Robert Louis-Leopold. It’s difficult to see here, but the women are gloriously skeptical of the harvester, who is trying to use his hips to get attention. If he truly wanted to impress them, he should show them how much wheat he harvested. Nothing impresses the ladies like yield. 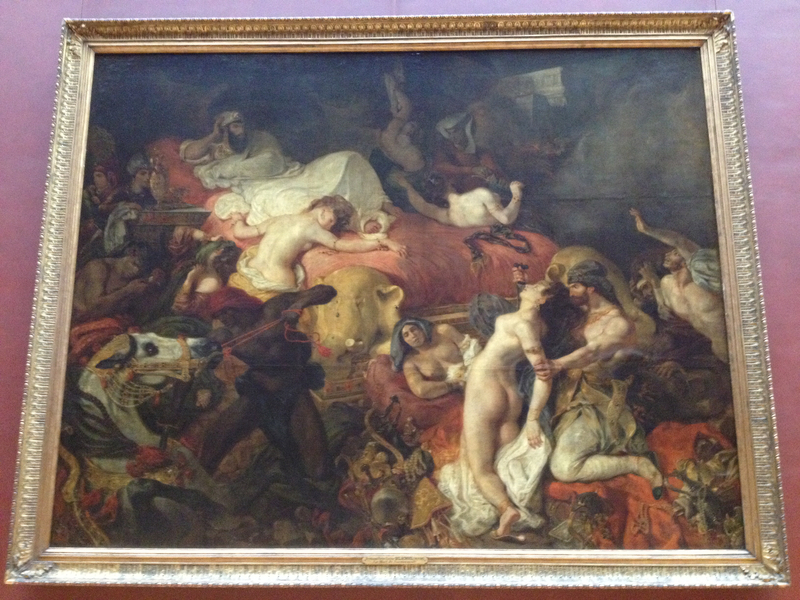 “The Death of Sardanopoulos” by Eugene Delacroix. 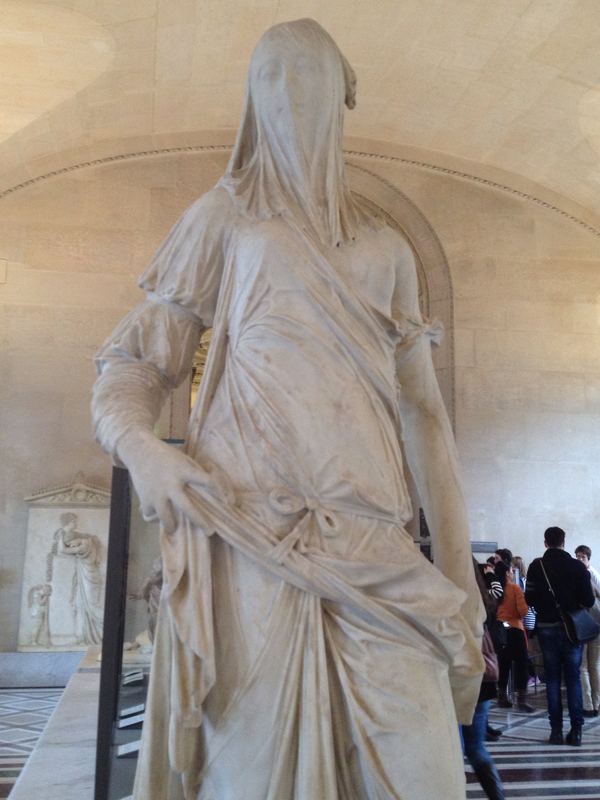 Perhaps one of my favorite pieces in the Louvre, because of the flow of form and tension. I feel like this large picture really captures the sensation of pulling/bracing against something, especially in the highlighted figures in the bottom right quarter of the canvas. I like to go up to the top floor of Sully, where the 19th century French painters are (there are other centuries too). Some of Delacrox and Gericault’s works are up here in miniature, as are their later paintings. 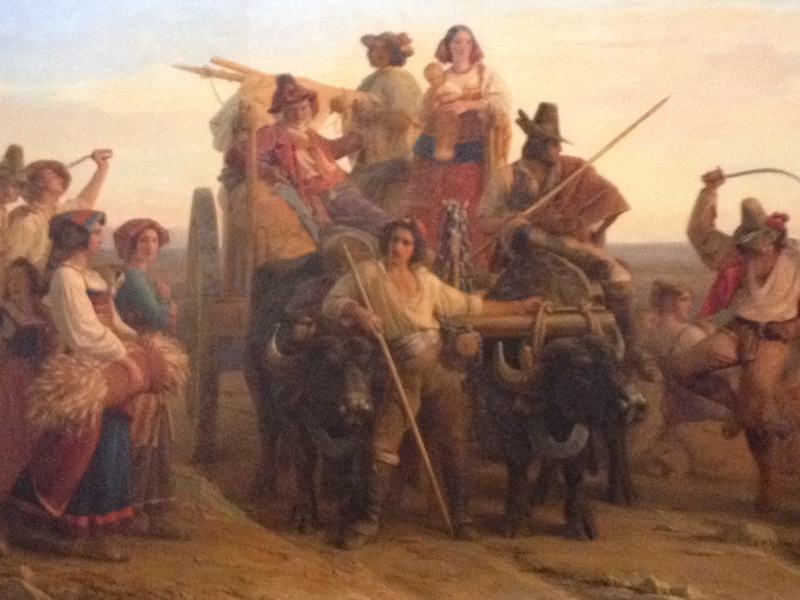 In fact, my favorite painting in the Louvre is up there, hidden away the corner of Salle 69. It’s an odalisque by Delacroix. If the world were ending, I would rob the Louvre of this one tiny painting. I go up and sit in this quiet, relatively unvisited section of the museum and reflect on the larger themes of life which the 9 to 5 clock keeps at bay. 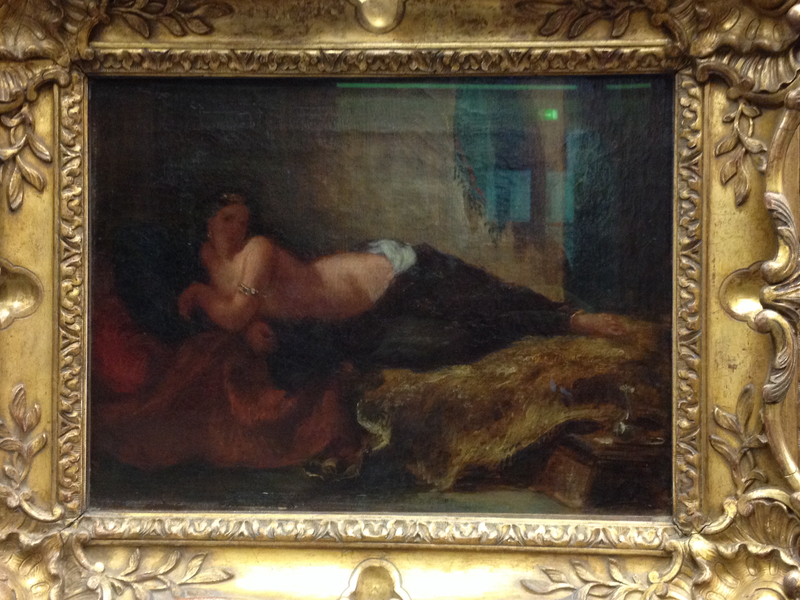 “Odalisque” By Eugene Delacroix. In my fantasy, when the world is ending, I will somehow magically get to Paris, get into the Louvre, and in the chaos of an art museum gone mad I surreptitiously take this painting from the wall and smuggle it back home, where I enjoy its company for the rest of my life (which, if it’s the end of the world, might not be that long). You’ll get tired walking around, and there are times when the crowds can be a little oppressive. Though they are a little marked up in price, don’t be afraid to take a rest at the food court or the Paul bakery (Paul is a little like a French version of Panera) in the center of the museum. Your ticket will get you back in as many times as you want that day, so there’s no reason to worry. If you must worry, worry about your goods. It must be said, unfortunately, but watch out for pickpockets. Keep your zippers in front of you, your pockets empty, and check your coat. I once watched a thief filch a few watches from the gift kiosk, as smooth as a revolving door. French pickpockets are masters of their craft, such as it is, but they’ll go for marks who make dumb decisions, like walking around with an open purse, or a wallet in a loose coat pocket. Also, don’t buy tickets from “good Samaritans.” They hang out in the Metro usually, and just happen to have a couple of tickets they don’t intend on using. They’ll either overcharge you, or the tickets won’t work. Common sense – if something sounds too good to be true, it’s probably false. When you have had your fill of beautiful art work, you can shop, should you wish it. The mall is full of higher end goods, and a McDonalds (if you want to fulfill your lifelong Tarantino dream of ordering a “Royale with Cheese”). Outside the Louvre, on the Rue du Rivoli, there are some nice shops going up and for a while, and if you head toward Concorde on foot you will eventually hit the Champs Elysees (and the Christmas market, should you go in the winter!). The afternoon is given over to recuperating at the hotel for a couple of hours. This is a great opportunity to run to the Monoprix and buy French groceries – madeleines and pate and cheap wine. Or to the nearby kiosk to grab some inexpensive postcards to send home. Or a chance to write down what you’re doing in a blog, including the backlog for the days you haven’t been writing…ahem. 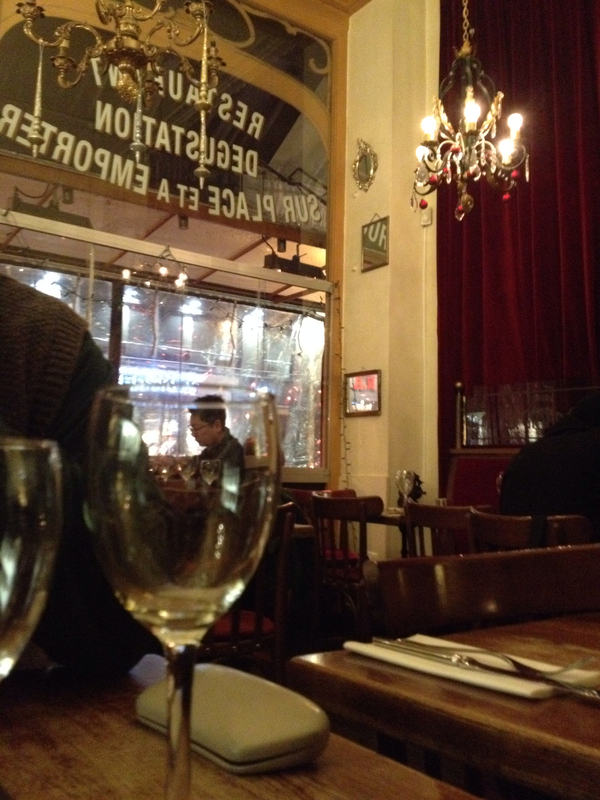 T provides the recommendation of her son – Comptoir de la Gastronomie (34 Rue Montmatre). It turns out to be a sundry store and restaurant. Reservations are highly recommended, as dinner service begins at 7 and everyone seems to arrive at once. There is a set menu and a seasonal menu, with rich and rarer fare. I order the doe, but get game fowl since the waitress has not yet mastered the English menu (Luckily, my French is friendly enough to point out that I can tell the difference between fowl and venison). Dad orders veal and escargot. The wine list is local and delicious. I highly recommend this restaurant if you have the time. It is just off of Saint Eustace Church (Elglise Saint Eustache), and near Les Halles metro. If you opt to take a taxi, make sure you specify 34 RUE Montmatre, not Boulevard Montmatre (the Boulevard intersects the Rue at some point). Having had a fine night out, and a decent day of walking, I can only hope I don’t wake up again at 3am full of all the worst thoughts in the world. Fingers crossed! This Post was posted in Food, Observations, Places and tagged art, Corradini, Delacroix, French Dining, Le Louvre, Louvre museum, painting, Paris, Paris Travel, Paul bakery, Pickpockets, Robert Louis-Leopold, sculpture, Tarantino. Bookmark the permalink.